Audio Introduction: What are Class D Amplifiers? These days, it’s easier than ever to have great bass in your car, regardless of what you drive. Whether you’re looking to improve the bass in your car without sacrificing trunk space, mount subs in your rear deck, or outfit your golf cart or Smart car with enough bass to shake the block, a shallow mount subwoofer is exactly what you need. Today, we’ll take a closer look at the best shallow mount subwoofer options you have, and dive into everything you’ll need to know before you make a purchase. 2.1 What is a Shallow Mount Subwoofer? 2.2 How Do They Compare to Regular Subwoofers? As the smallest speaker in Rockford Fosgate’s Punch line, the PS3D2 strives to provide impressive bass in a compact 8” size. The PS3D2 provides some impressive thump given its small size, and it’s ideal for those who are looking for a highly responsive sub to balance out their car audio system. With a max RMS of 300W and a sensitivity rating of 82dB, the PS3D2 does deliver impressive power and sensitivity given its small size. With a mounting depth of only 2 ⅝”, this sub is ideal for installations in, especially tight quarters. An anodized aluminum cone, low impedance rating and Santoprene rubber surround help make this speaker particularly durable, so you can feel good about purchasing this one for the long haul. Keep in mind that at only 8”, this speaker is best for adding balance to your current system. While it is punchy and responsive, you certainly aren’t going to knock anyone’s socks off with deep, powerful bass from this compact speaker. Strong, durable and punchy, the PS3D2 from Rockford Fosgate is a powerful little sub that can bring balance to any car stereo. The sub is well made and durable and capable of standing up to whatever you can dish out. While it won’t be winning any awards for bringing earth shattering bass, this sub is certainly a winner for most small car stereos. If you’re looking for a compact sub with tons of power to spare, the Pioneer TS-SW2002D2 is well worth a closer look. With an impressive 600W max RMS and a high sensitivity rating of 86dB, this 8” sub from Pioneer is punching well above its weight class. This speaker uses an oversized cone structure which allows for a larger cone in the same sized footprint. The cone itself is reinforced with resin injected mica to create a lightweight and rigid cone that provides impressive bass response. Thanks to the oversized cone, this small sub sounds larger than it’s 8” size would have you think. The sub also has an impressive frequency range given its size, and it can faithfully reproduce anything in the 20-200Hz range. If there are any issues at all with this speaker, it may be the voice coils. Several users have complained that one of the voice coils failed them after a few short months. While these all seem like isolated incidents, it is worth mentioning. This sub brings everything you could want to the table. It’s powerful, sensitive and produces deep, powerful bass across a wide frequency range, which is uncommon for 8” subs. While the voice coil issue is cause for concern, this may be the best overall 8” shallow mount sub available. Kicker has developed a reputation for bringing deep, powerful bass to the masses with their high quality and affordable subwoofers. This 12” sub from their popular CompVT line aims to provide that same powerful bass in a compact frame that can be installed practically anywhere. It has an impressive max RMS of 800W and a frequency range of 25-350Hz. Perhaps the most impressive aspects of the CVT124 are its build quality. This sub features a four-layer high-temperature voice coil, ribbed Santoprene surround that’s stitched to the speaker, and an injection molded SoloKon cone. It’s safe to say that this speaker is built to stand the test of time. It’s a bit deeper than other shallow mount subs, but that’s to be expected in a 12” subwoofer. At 4 ⅜” deep, this sub should still work for virtually all applications where a shallow mount sub is required. The CVT124 provides pretty impressive bass given its compact size. This sub is powerful and built to stand the test of time. While it’s 4 ⅜” depth may be prohibitive for installations in really tight spaces, most people will find that the CVT124 fits their needs while delivering impressive performance. If you’re looking for a speaker with serious headroom, the Kenwood Excelon line is one to take a closer look at. This compact 12” sub features an impressive 1400W max RMS, which is more power than any reasonable person will ever need. The Excelon also posts impressive sensitivity numbers at 91dB and a wide frequency range of 30-700Hz. While the frequency range is wide, we’d prefer to see a smaller range with a bit more low end, as you’d be surprised how often frequencies of 25 or 20Hz come into play. Durability wise, the Excelon features a high-tech carbon glass fiber cone, butyl rubber surround and a single voice coil with an impressive heat transfer system. It’s safe to say that this sub is built to stand up to whatever you can dish out. While the single voice coil does limit the amount of boom you’ll be able to get out of this sub, we’ve yet to find an application where this sub didn’t perform adequately. As for mounting, at nearly 4” deep, this sub is on the deeper side as far as best shallow mount subwoofers go, but it should still be narrow enough for virtually all applications. With its impressive power handling and sensitivity and overbuilt design, the Excelon 12” shallow mount sub from Kenwood is certainly one worth taking a closer look at. While the single voice coil does limit the amount of thump you can get out of this speaker, most people will find that it provides an ideal sound for their needs. If you’re looking for a top of the line subwoofer that pulls out every possible stop to achieve impressive bass response while maintaining a small footprint, the SWR T10 from Alpine may be the one for you. Alpine rolled out lots of innovative new technology with the Type R line, all of which designed to provide the performance of a full sized subwoofer in a tinier package. At only 3 ¼” deep, the SWR T10 can be mounted virtually anywhere, but you’d probably have no idea you were listening to a shallow mount sub if you weren’t told. The max RMS of 600W is fairly pedestrian, as is the 28-200Hz frequency response. These benchmarks are all fairly pedestrian, where the SWR T10 shines is in the innovative technologies that Alpine has developed to give it a bigger, fuller sound. Features like an oversized 100mm voice coil, injection molded cone, and patent-pending spider design allow this speaker to move air and produce bass as only a full-sized sub can. Other innovative features, like a radial vented VC heat sink with airflow management system help to keep this speaker well cooled so it can perform at a higher level for the life of the speaker. Alpine dumped tons of R&D into the development of their Type R line, and it shows. The SWR T10 is one of the best sounding compact subs you’ve ever heard. That said, all this innovation comes at a price, and the T10 is one of the most expensive 10” subs on the market. If you’re looking for the highest quality regardless of price, take a closer look at this speaker. Otherwise, you may want to consider your other options. The CVT104 is the 10” version of Kicker’s popular CVT124 that we profiled earlier. If you like what you hear about the CVT124, the CVT104 is no different. It features the same components inside a 10” speaker, which delivers a bit more responsiveness and punch while still retaining a healthy amount of boom. The CVT104 is slightly shallower than the CVT124, with a mounting depth of 4 ¼” as opposed to 4 ⅜”. But, both speakers are a little on the deep side for a shallow mount sub, and there may be a few situations where this speaker isn’t shallow enough for your installation. This speaker generates a max RMS of 800W, and the sensitivity is fairly impressive, coming in just north of 87dB. Thanks to it’s 10” size, the frequency range is also expanded from the CVT124, and this subwoofer will handle frequencies from 25-500Hz. Outside of these differences, the CVT104 features the same components and materials as the CVT124, and thanks to its shallow mounting depth, this sub is ideal for anyone who likes the CVT124 but was unable to install one because of its depth. Kicker always manages to offer a good blend of punch and presence in a well-built speaker for a middle of the road price. There may be better subwoofers at a variety of price points in this category, but Kicker certainly brings a unique sound and perspective to car audio that lots of people love. The CVT104 is no different, and it’s worth checking out if you’re in the market for a 10” sub. When it comes to professional car audio, no name is as synonymous with excellence as JL Audio. JL Audio is known for producing some of the best sounding, most responsive and well-tuned subwoofers on the market, and the 13TW5V2 is no different. The first thing you’re likely to notice about this sub is its unique size. At 13.5”, this speaker blends the block shaking boom of a 15” with the responsiveness of a smaller subwoofer. It’s also incredibly thin, with a mounting depth of only 2.5”, which makes this one of the most compelling choices for challenging installations. This sub has a max RMS of 600W and an exceptional frequency response of 20-500Hz. A DMA optimized motor, massive 7” voice coil, Santoprene surround and mica infused polypropylene cone ensure that this speaker is built to stand the test of time. While it may not be quite as powerful as some other subs, this is one you need to hear to fully understand. In my opinion, there isn’t a subwoofer on the market that can deliver the same level of performance as this model from JL Audio, especially given its extremely shallow design. This sub is musical, and it provides plenty of bass while maintaining great definition and clarity. If there’s any knock on this subwoofer, it’s the price. Granted, this sub is worth every penny of it’s near $600 price, but the average user is going to be priced out. It’s no secret that JL Audio is the leader of the pack when it comes to car audio. The 13TW5V2 is arguably the most impressive subwoofer in the category, and it provides a level of bass response and clarity that you’d never associate with a shallow mount sub. If you’re willing to break the bank to own one, this may be the best bet for you. Whether you opt for one of the subs that we’ve covered above, or if you’re planning on checking out any of the countless shallow mount subs we haven’t discussed, there’s a few things you’ll need to know before you head to your local car audio store. What is a Shallow Mount Subwoofer? A shallow mount subwoofer provides the same functionality of a traditional subwoofer in a smaller package. Regular subwoofers are deep and heavy, and their size can make it difficult or impossible to mount them in small spaces. Speaker companies recognized that for certain applications, a traditional sub wasn’t practical, and they’ve developed subwoofers that require 4” or less of mounting clearance to remedy the problem. These shallow subs can easily be mounted in rear decks, along the sides of trunks, or in slim boxes that allow you to enjoy powerful bass without sacrificing much space. How Do They Compare to Regular Subwoofers? Compared to a traditional sub, shallow subs are much lighter and more portable, in addition to being thinner. They’re easier to mount, they can be mounted virtually anywhere, and they’re also much more portable than a traditional sub. On the other hand, shallow subwoofers represent a significant departure from the design of traditional subwoofers. What you gain in ease of installation and space savings, you lose in sound quality. Simply put, a shallow mount sub will never be able to compare to a traditional sub in terms of bass response or overall sound quality. That said, they’re still an ideal option for those who are looking to add full, deep bass to their car, but can’t install a traditional subwoofer for whatever reason. If you’re looking to buy a regular subwoofer , have a look at our list of best subwoofer for car. When you’re evaluating different options, there’s a few key metrics you’ll want to look at so you can ensure you’re comparing apples to apples, and selecting the best shallow mount subwoofer for your needs. The size of the subwoofer is the most important consideration you’ll need to make when shopping for a new sub. You’ll find subwoofers in 8”, 10”, 12” and 15” sizes, and each size brings it’s own characteristics, pros and cons. Smaller subwoofers, like an 8” or a 10” are the most responsive and punchy option. They’re a great choice for those who listen to heavy rock or fast paced electronic music. They can bring balance to a sound system, and provide good bass without overwhelming the system. But, if you’re looking for powerful bass that will turn heads, you’ll want to look for a larger sub. 12” subwoofers are arguably the most popular option on the market, as they offer the “best of both worlds.” A 12” sub provides deep and powerful bass, but it’s still responsive enough to handle faster paced music, such as hard rock and metal. 15” subwoofers are the largest and most powerful option, and they’re typically reserved for the true bass heads among us. A 15” sub provides the deepest and most powerful bass of any subwoofer. But, they’re large size makes them far less responsive, and they tend to muddy up or overwhelm any faster paced music. 15” subs are most popular for today’s 808 heavy hip-hop. Peak power refers to the amount of power the subwoofer can handle without any damage occurring to the subwoofer. This metric is a good indicator of how powerful the sub is compared to the competition. A speaker’s sensitivity is another important metric to consider. Sensitivity is measured by how loud the speaker is with only one watt of power driving the speaker. If you’re not using an external amplifier, a high sensitivity speaker will provide you with more volume and power. If you’re using an amp, a speaker with lower sensitivity will be better for your needs. The frequency range refers to the different frequencies the speaker is able to reproduce. A broad frequency range makes for a more versatile speaker, but that’s less of a concern when shopping for a subwoofer. The frequency range is measured in hertz (Hz) and subwoofers usually have a frequency range between 20-200Hz. 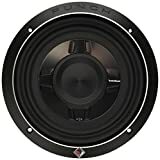 An average subwoofer may not be able to dip below the 100Hz range, while more expensive, professional quality subwoofers can dip as low as 20Hz. Thanks to shallow mount subwoofers, it’s easier than ever to achieve deep, powerful bass in your car, regardless of what you drive. While there are some tradeoffs with a shallow mount subwoofer, the benefits greatly outweigh the drawbacks for most applications. When you’re shopping for the best shallow mount subwoofer for your needs, be sure to evaluate important factors like the specs, build quality and overall sound of the sub before making your purchase. Also have a look at the best subwoofer for car. Join our 100,000+ Car Audio enthusiast community and get our "everything car audio" newsletter with the latest product news, gear reviews, and buying guides! We HATE spam, just like you. Your e-mail will not be sold or shared with anyone! James is an Automotive Mechanic with over 20 years experience and 300+ car repairs. He is an expert with cars and has worked with different models from the biggest brands. Caraudiologic is a participant in the Amazon Services LLC Associates Program, an affiliate advertising program designed to provide a means for sites to earn advertising fees by advertising and linking to Amazon.com.